September is Prostate Awareness Month! We’ve been looking for a fun way to celebrate Prostate Awareness Month. We thought about parking outside Sun Life Stadium before the next Dolphins home game and handing out Uromedix seat cushions, but we couldn’t find a tailgate-worthy ride capable of carrying 76,000 seat cushions plus a cooler. Uromedix invites every man in South Florida over the age of 45 to get a prostate exam! Since the 1990s, total incidences of prostate cancer have dropped significantly in this country. That’s great news! But this is no time to sit on our laurels. Not because sitting on laurels is bad for prostates, but because the key to keeping those numbers falling is early detection. 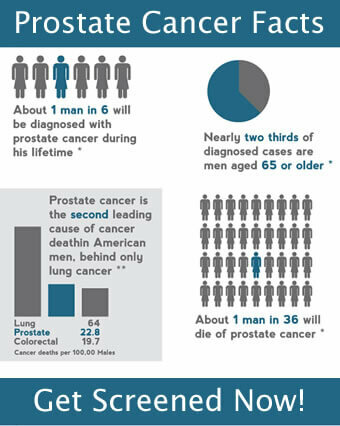 Prostate cancer can begin without any obvious outside signs or symptoms. At Uromedix, we utilize a proven screening strategy incorporating both the well-established digital rectal exam (DRE) and the prostate-specific antigen (PSA) test. PSA is a protein found in the prostate. The PSA test uses a blood sample to check whether PSA levels are unusually high, an indicator of a tumor. Together, these 2 tests offer a screening process that’s reliable, minimally invasive, and takes little time. If anything of concern is discovered during your exam, there’s nowhere better to be than Uromedix. Our urologists are South Florida’s leading authorities on prostate health, and we use the most state-of-the-art treatment technology available today. We’re experts in cutting edge treatments like Laparoscopic DaVinci Prostatectomy and TUMT procedure, as well as established methodologies like Cryotherapy and Microwave Therapy. Though prostate cancer rates are indeed dropping, Miami-Dade and Broward Counties account for more than 20% of the reported incidences in the State of Florida. So celebrate Prostate Awareness Month by calling us to make an appointment to get your prostate checked – schedule a prostate exam today!